MyScope: MyScope control windows are created using a simple, visual drag-and-drop process. MyScope: Once created, they are just like other control windows in the instrument and are easily accessed from either the menu or button bars. 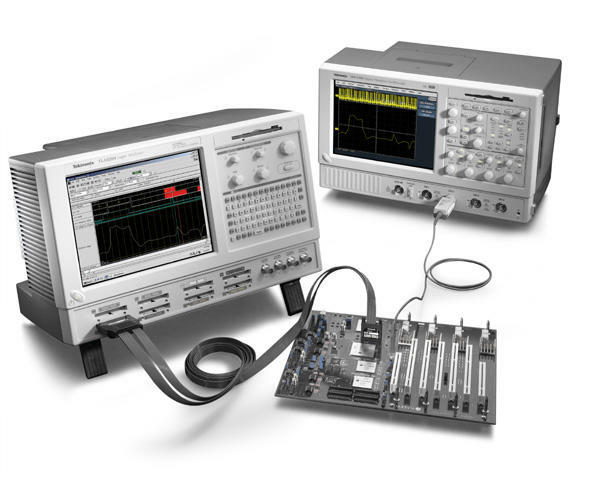 The TDS5000B models offer a Tektronix-exclusive MyScope customizable oscilloscope user interface. MyScope is a powerful feature that allows you to build your own control windows with only the controls, features, and capabilities that you care about and are important in your job. Only with Tektronix oscilloscopes, can you pull all the functionality you need from all the various parts of the oscilloscope into one control window, effectively creating your own personalized “toolbox” of oscilloscope features. No longer do you need to search through menus for features or relearn how to drive the oscilloscope after a break from the lab. MyScope control windows enable you to spend your valuable time focused on the task at hand rather than navigating menus on your oscilloscope. And creating these custom control windows isn’t a long drawn-out or complex process. They are easily created in a matter of minutes using a simple, visual, drag-and-drop process. Once created, these custom control windows are easily accessed through a dedicated MyScope button and menu selection on the oscilloscope button/menu bar, just like any other control window. You can make an unlimited number of custom control windows, enabling each person who uses the oscilloscope, in a shared environment, to have their own unique control window. Since the control windows are stored as files on the hard drive, they can easily be transferred to other TDS5000B Series oscilloscopes, or they can even be e-mailed to a coworker around the world when the need arises. 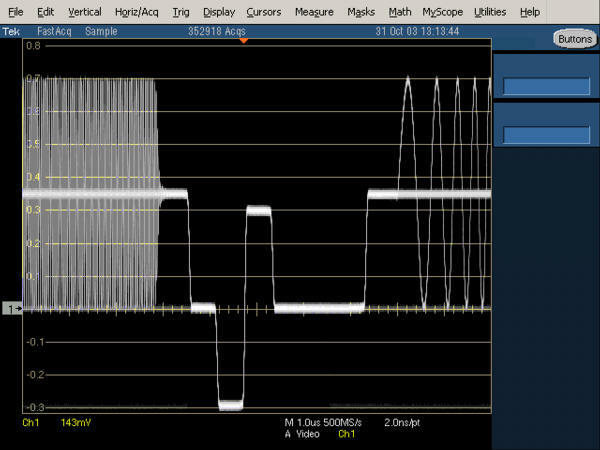 MyScope control windows will benefit all oscilloscope users, from eliminating the ramp-up time that many face when returning to the lab after not using an oscilloscope for a while, to the power user who can now operate far more efficiently. Everything you need is found in one control window rather than having to constantly navigate through menu after menu to repeat similar tasks. The TDS5000B Series also enables a comprehensive suite of right mouse-click menus to make simple things as they should be – simple. Right-click menus are context sensitive, meaning the choices presented in the menu depend on where you right-clicked the mouse. This makes right-click menus extremely intuitive. Want to change the cursor type? Right-click on a cursor or the cursor readouts. Want to change the reference levels of an automatic measurement? Right-click on the measurement. Want to change trigger parameters? Right-click on the trigger readouts. Want to change a waveform’s color? Right-click on the waveform handle. Virtually all objects on the oscilloscope display have right-click menus associated with them that include all the appropriate actions or features relative to those objects. There are also right-click menus for regions of the display in addition to just objects. For example, right-clicking in the main graticule brings up a menu with choices such as Clear Data, Default Setup, Autoset, Screen Captures, Save All Waveforms, and Add Screen Text, providing single-click access to many of your most commonly performed tasks. The customization and efficiency provided by MyScope control windows and right-click menus make the TDS5000B models the world’s easiest-to-use midrange oscilloscopes, enabling you to achieve levels of productivity you wouldn’t have thought possible with your current oscilloscope. The TDS5000B Digital Phosphor Oscilloscopes (DPO) deliver 350 MHz, 500 MHz, or 1 GHz bandwidth, 5 GS/s real-time sample rate, up to 16 M record length, and a suite of advanced triggers, enabling you to capture and characterize even your most demanding signals. DPOs provide unmatched insight into signal behavior by displaying, storing, and analyzing complex signals in real time using three dimensions of signal information: amplitude, time, and distribution of amplitude over time. The TDS5000B DPO models, enabled by Tektronix proprietary DPX® acquisition technology, deliver greater than 100,000 waveforms per second capture rates. 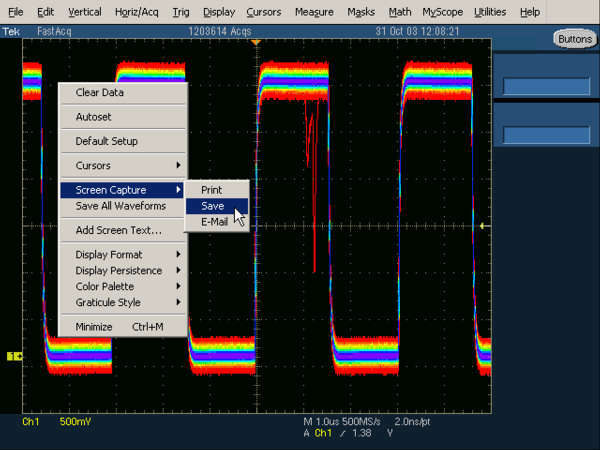 Some oscilloscope vendors claim high waveform capture rates for short bursts of time, but only DPOs, enabled by DPX technology, can deliver these fast waveform capture rates on a sustained basis – saving minutes, hours, or even days by quickly revealing the nature of faults so sophisticated trigger modes can be applied to isolate them. The TDS5000B models include a complete parametric measurement system for signal characterization. Select from 53 automatic measurements using a graphical palette that logically organizes measurements into Amplitude, Time, Combination, Histogram, and Communications categories. Gather further insight into your measurement results with statistical data such as mean, min, max, standard deviation, and population. 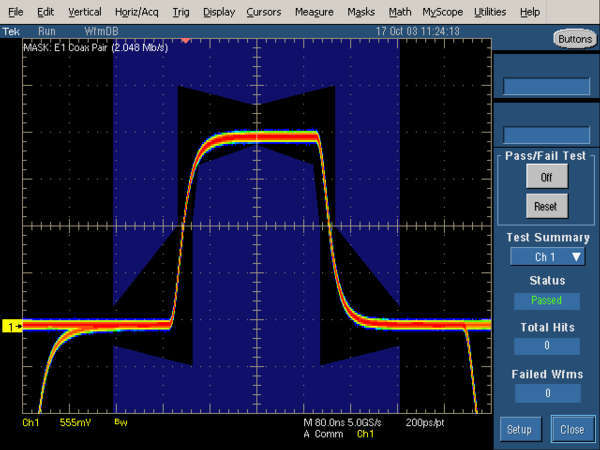 Waveform cursors make it easy to measure trace-to-trace timing characteristics, while cursors that link between YT and XY display modes make it easy to investigate phase relationships and Safe Operating Area violations. Define and apply math expressions to waveform data for on-screen results in terms that you can use. Access common waveform math functions with the touch of a button. Or, for advanced applications, create algebraic expressions consisting of waveforms sources, math functions, measurement values, scalars, and user-adjustable variables with an easy-to-use calculator-style editor. Applied measurement extensions can be installed to enhance the TDS5000Bs’ capabilities. These software applications build on the precision acquisition performance of the TDS5000B Series to address the need for application-specific measurements to quickly quantify device and system performance. Optional applications include power measurement and analysis, jitter and timing analysis, disk drive measurements, ANSI/ITU telecom pulse compliance, and Ethernet compliance testing. The TDS5000B Series includes open access to the MS Windows 2000 operating environment. 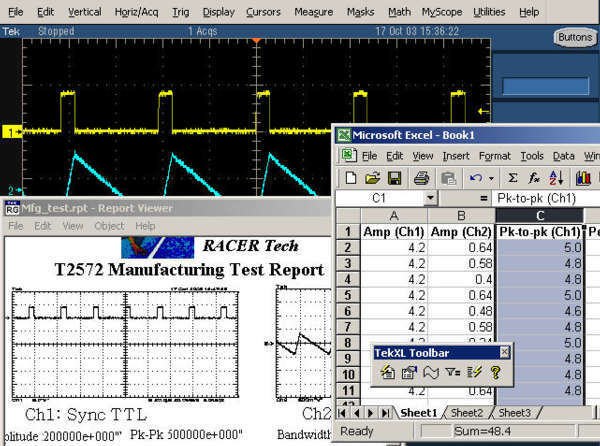 While the instrument remains a dedicated oscilloscope, the ability to access the MS Windows desktop creates a powerful tool. Built-in applications such as WordPad, Paint, and a Web browser allow you to concurrently maintain lab notes while working with the instrument. This saves time and eliminates error-prone steps associated with transporting images for later report development. Other applications such as Microsoft Word or Excel, MATLAB, and LabVIEW can be used with the instrument to accomplish local documentation or signal analysis. Installation of the oscilloscope on the LAN enables Web-based information browsing, e-mail exchange, printing, and file sharing. Using the embedded PCI bus, waveform data can be moved directly from acquisition to analysis applications on the Windows desktop at much faster speeds than conventional GPIB transfers. In addition, the OpenChoice architecture provides a comprehensive software infrastructure for faster, more versatile operations. Data transfer programs, such as the Excel Toolbar, Word Toolbar, and Report Generator are used to simplify analysis and documentation on the Windows desktop or on external PCs. 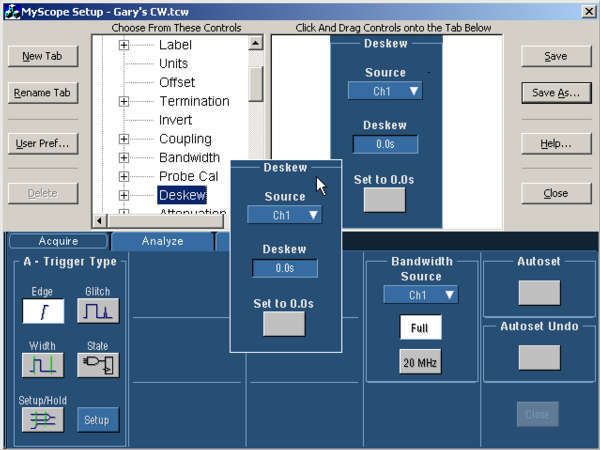 Implementation by Tektronix of industry-standard protocols, such as TekVISA™ interface and ActiveX Control, is included for using and enhancing Windows applications for data analysis and documentation. These tools enhance your ability to create custom software to automate multistep processes in waveform collection and analysis with Visual BASIC, C, C++, MATLAB, LabVIEW, LabWindows/CVI, and other common Application Development Environments (ADE). Integration of the oscilloscope with external PCs and non-Windows hosts is also supported by the TDS5000B Series software solutions. Plug-and-Play and IVI instrument drivers are included to enable easy communication with the oscilloscope using GPIB, Serial, and LAN connections from programs running on the instrument or an external PC. Applications, and other LAN resources, can connect directly over Ethernet using the VXI 11.2 server included on the TDS5000B models. The unparalleled ease of use, coupled with the TDS5000B’s performance, OpenChoice platform, and comprehensive feature set all in a compact benchtop package, provides exceptional value. The TDS5000B's performance features make it ideal for a multitude of applications, such as digital design and debug, power measurements, communications mask testing, and video design. Digital Design and Debug. Tektronix Integrated View (iView) fully integrates the performance and measurement accuracy of a Tektronix oscilloscope with the multichannel and powerful triggering capabilities of a Tektronix logic analyzer in one display, allowing designers to quickly verify and debug their designs. 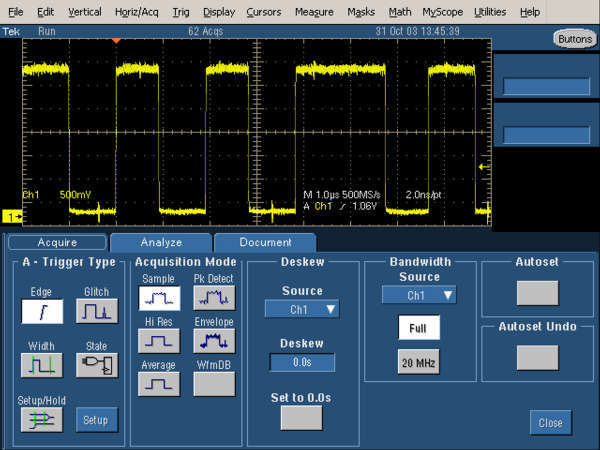 The interoperability of the TDS5000B oscilloscopes with the Tektronix TLA5000 Series logic analyzer made possible by Tektronix Integrated View (iView™) enables digital designers to solve signal integrity challenges and effectively debug and verify their systems more quickly and easily. The iView feature fully integrates the industry-leading performance and measurement accuracy of a Tektronix oscilloscope with the multichannel and powerful triggering capabilities of a Tektronix logic analyzer. This integration allows designers to view time-correlated digital and analog data in the same display window and isolate the analog characteristics of the digital signals that are causing failures in their systems. 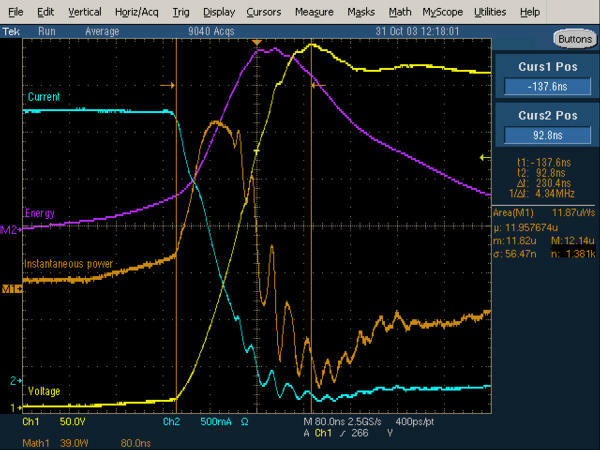 The iView Wizard simplifies this integration of the oscilloscope and logic analyzer by guiding the user through setup and connection. No user calibration is required. And, once set up, the iView feature is completely automated. The result – an integrated tool set for digital design and troubleshooting. Power Measurements. Channel 1 (yellow, labeled Voltage) shows the turn-off voltage on the FET of a switching power supply, with current on Channel 2 (blue, labeled Current). The Math 1 waveform, M1 (orange, labeled Power), is the instantaneous power resulting from the multiplication of the voltage and current waveforms (Ch. 1 * Ch. 2). The Math 2 waveform, M2 (purple, labeled Energy), is the result of a calculation of the integral of M1, a math-on-math operation of the TDS5000B models. An energy measurement, located to the right of the display, is a gated measurement made on M1 and includes statistics. The TDS5000B's powerful and flexible measurements, math, and math-on-math capabilities make them ideal solutions for making power measurements, such as voltage, current, instantaneous power, and energy for power device designers. Option SM provides a complete portfolio of masks for verifying compliance to serial communications standards. Masks are provided for electrical standards. Easily tailor mask testing to your specific requirements using features such as one-button mask autoset, autofit, user-adjustable mask margin tolerance, hit counting, failure notifications, and built-in mask editing. Tektronix-exclusive DPX acquisition technology sets the TDS5000B Series apart from competitive digital oscilloscopes, enabling the capture of up to 100,000 waveforms per second for a live, analog-like display. The TDS5000B models also support a wide variety of video standards with dedicated triggers including NTSC, PAL, SECAM, and analog HDTV. In addition, IRE and mV graticules can be selected for easier measurements and visual inspection. All of this together makes the TDS5000B Series an ideal tool for video design and development. *1 Does not include accessory pouch. *2 From rack mounting rear to back of instrument.